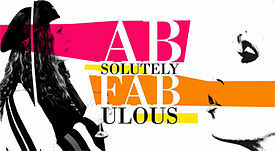 Absolutely Fabulous, well maybe not anymore. Absolutely Fabulous has got to be one of my favorite shows, I mean the scenes of Patsy wiping her nose would have me in stitches. So, when I saw there was a new season, I slapped on the p-jammies, grabbed a tub of B&J-Cherry Garcia, downloaded the new episode, fluffed the pillow, and readied myself to fall of the bed in hilarity. Only, that isn’t what happened, it was more like watching a train wreck, and not being able to look away. I sort of laughed, because there was nothing else to do, my ice cream melted because I was eating it so slowly, more a repetitive movement-spoon to mouth-pause-stare at screen-shake head in disbelief-put spoon in bowl-repeat. Dear god! Have we all aged so much?! Patsy looks about as white as the coke she was so famed for snorting. Edina’s face has stopped moving all together, not to mention, she has put on a few pounds, but haven’t we all? Saffy, has wrinkles, and Bubbles is way too old to continue being called Bubbles. Over all, I felt the everybody was just going through the motions, and locked into character that 10 years ago were funny, but now are just tired. Ok, I am off to watch episode 2, I just can’t help it. All that botox in one room is too much to resist.